Drone Conditioning is an attempt to use satire as a way to communicate both events and affects going on overseas that are not widely spoken about nor theorized¨ while also highlighting the American privilege in relation to drone strikes. I hope this piece makes the viewer aware of ideas and experiences that other individuals in the world are enveloped within every day¨ while reminding the viewer that they will never experience such trauma and destruction. Over the past few years, it has become ever-­more apparent that the interest in a global integration of drones is picking up speed. Unfortunately, the surveillance and destruction invoked by contemporary drone use in Pakistan and Yemen has left individuals with a perpetual fear of the drone itself -­ the never-­ceasing buzzing of a U.S. drone a constant reminder of such horrific events that could arrive at literally any moment. Will you be prepared when the drones make it to your home? It’s scientifically proven that sound conditioning works. By introducing you and your loved ones to the sound of the drone long before they’re hovering above your neighborhood, you can preemptively eliminate such stress and anxiety! 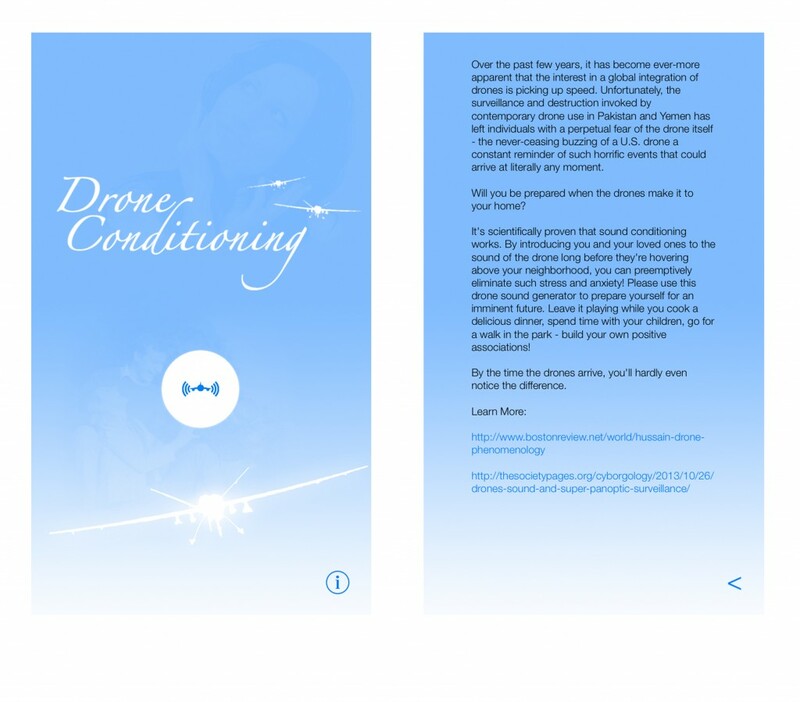 Please use this drone sound generator to prepare yourself for an imminent future. Leave it playing while you cook a delicious dinner, spend time with your children, go for a walk in the park -­ build your own positive associations! By the time the drones arrive, you’ll hardly even notice the difference. Simon Remiszewski is an artist from Worcester, MA, currently residing and working in Boston, MA. His own creative practice is transdisciplinary, primarily driven by research-­based engagements with events and ideas. Simon is not interested in convincing audiences through his work, more focused in presenting a space for audiences to take a stance. He has shown work as part of Murmuration Festival and in Salad Magazine, and is currently completing a BFA at the School of the Museum of Fine Arts.